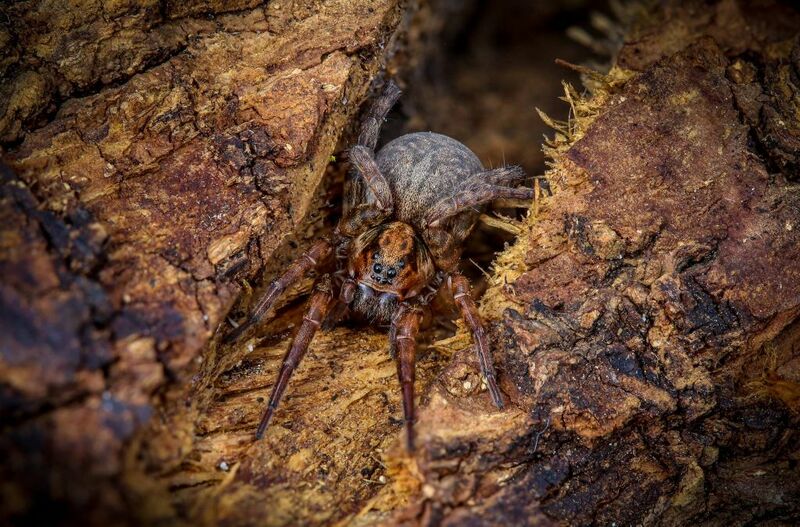 Wolf spider, (Trochosa sp?) 22 image hand held stack. Asturias, Northern Spain. More details about technique? I am curious about how long it took to shoot the 22 images. Is this a live subject? The one leg that is held up looks to be missing a segment. The subject was very much alive and went on its merry way shortly afterwards. No missing segments, just the angle of the shot, I have uploaded 2 more from the same set. 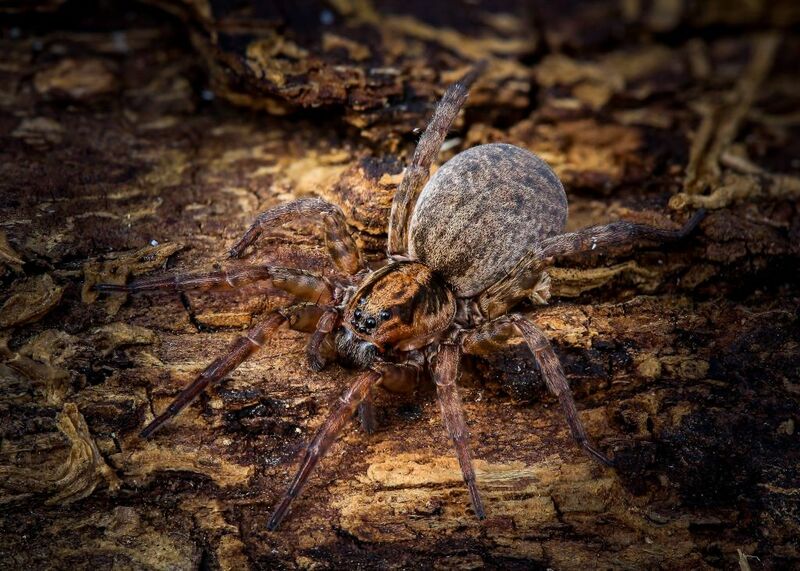 The spider was placed on a piece of firewood and moved on to a table outside. Lens was a Canon 100mm macro, manual focus and the settings were 1/250 f8, iso was left to the camera to sort, ranged 800 to 1600 but as it was to be stacked I was not too concerned with grain. I basically focused on the foot nearest to me, centered to the central focusing square on one part and whilst holding the shutter down move as smoothly as possible from front to back keeping the centre focusing square in the same point as much as able. Whole shot took about 3 seconds, redid the same shot about 3 times as sometimes you miss that crucial point and you get soft bands, this was the best of this shot. Managed 3 different angles about 150 shots in total before the spider had had enough. Hope this helps, need to work more on my retouching though, getting there though. Got it -- motor drive and lean in -- 3 seconds for 22 images. Excellent work! Nice light and matching colors. You nailed this difficult challenge of showing the animal in its envorinment. Thank you. Moving it was a must as it had decided to spend the night under the kitchen door (hence the title). 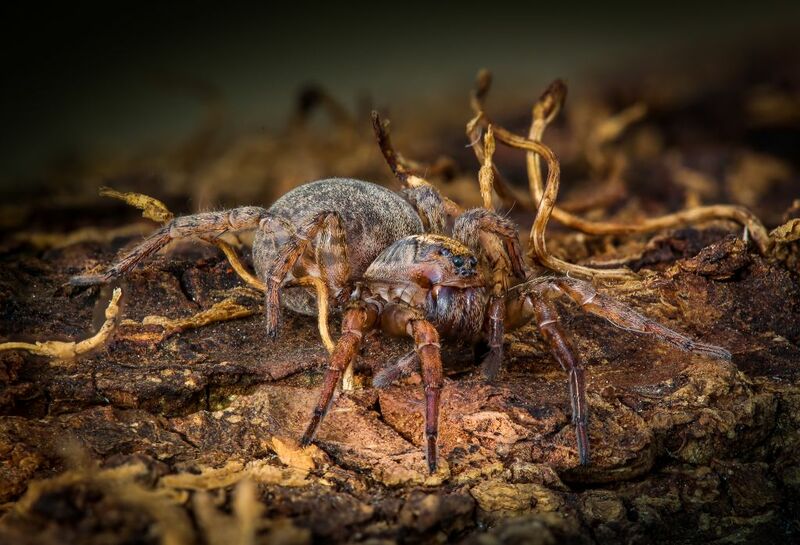 For scale, the last shot shows the spider sitting in a groove from a chainsaw cut, about 7mm wide. Great images, thanks for sharing details on your technique! A basic question that I have is how do you illuminate the subject? Is it a separate light source with constant lighting? Lighting is all natural, no flash or diffusers just daylight.